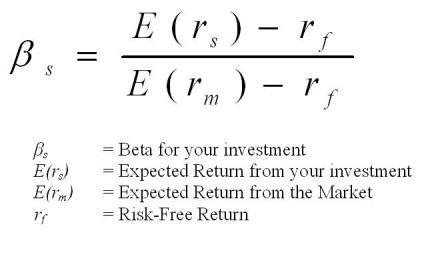 Investors use the beta calculation to figure out how close their investments will follow the performance of "the market". Most of the time, you will hear people mention "beta" when they are talking about asset allocation and diversification. This is because beta represents a concept called correlation; the relationship between two things. For this page, the two things are the return from a stock and the return from a market. Beta measures the relationship between the changes in stock price and the price changes in a market index. Since the markets are often thought of as an economic system, beta is also called a measure of "market" or "systematic" risk. You may remember the term "systematic risk" because it was used over and over again during the financial crisis of 2008. Why use the Beta Calculation? The concept of beta comes from the Capital Asset Pricing Model (CAPM). Basically, the goal of diversified investments is to put together a group of stocks (i.e. your portfolio of stocks) with a combined beta as close to zero as possible. In theory, a group of stocks with a beta equal to zero will rise and fall in price independently of the general market. For you, this means that your investing returns will remain steady and consistent. Keep in mind that beta comes from a model. And as with any model, it is an approximation and does not hold true in every single situation. Think of it as a guideline, rather than a rule or law. This is the rate of return that you expect to get from your investment. This variable captures peoples "guesstimate" on market performance. With the beta calculation, EVERYTHING is relative, so it is an absolute MUST to define "the market" in terms of an actual market index (S&P500, Dow Jones Industrial Average, NASDAQ 100, etc.). For many, this is a chance to plug-in the 6%-8% long term return of the "market". Keep in mind that if you choose to use a "long-term" percentage, the Beta you calculate will also be for the same "long-term". The rub is that the longer the outlook, the more uncertainty exists. And higher uncertainty means that your calculation for Beta is less likely to be correct. In reality, a risk-free return is impossible. There is always risk, however slight. So that also means there is no truly risk-free investment vehicle either. Historically, U.S. Treasuries are the closest thing to a risk-free investment, because they are guaranteed by the United States government. So the expected return of U.S. Treasuries is used as a substitute for risk-free return, because it is as close as you can get. Here is a simple and effective example of how to use the beta calculation. Suppose that you would like to know the beta value for one of Vanguard's S&P500 Index Funds (VFINX). To keep things simple, I assumed an expected market return for the S&P500 of 8% and a risk-free return of 2%. And with a little research, I found that the VFINX mutual fund has an expense ratio of 0.18%. For more information on the importance of the expense ratio on your investments, click here. The expected return of VFINX is equal to the expected return of the S&P500 (8%), minus the expense ratio for VFINX (0.18%), which equals 7.82%. This means that for every 1% move in the S&P500, VFINX can be expected to move 0.97%. So, if the S&P500 goes up 10% next year, you can expect VFINX to rise 9.7%. Or, if the S&P falls 10% next year, you can expect VFINX to fall 10.3% (because you still have to pay the expense ratio regardless of performance!). If the expected return of an index fund isn't REALLY REALLY REALLY close to the expected return for the index it follows, it is NOT a good index fund!